I can't say enough good things about this band - I've been hooked on their new CD, Stages, since my first listen! If you think you haven't heard them you're probably wrong - especially if you happened to catch The Hills on MTV recently. Vedera was featured on the show during an Epic Showcase, and several of their songs appeared throughout the episode. The band is fronted by, Kristen May, whose voice is artistic and powerful. The band's "indie-pop" flare is exhibited quite well on their sophomore album, and I encourage all of you to check it out! Click the banner on the side to receive a free download of their new single, "Satisfy". 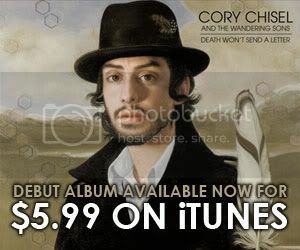 Cory Chisel’s new album, "Death Won't Send A Letter" is great and it’s only $5.99 on iTunes until! So check it out now! Click here to see Cory Chisel's new video for his song "So Wrong for me"
Win Tickets to Gossip's Tour! 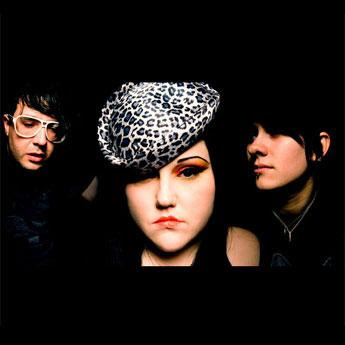 All you have to do is log onto the gossip's Official Message Board and tell them why "I can't wait to go to the Gossip show in ________ because...", and you will be automatically entered to win (1) pair of tickets to the Gossip show of your choice BUT be sure to include which city you want to win tickets for in your post. Here is the tour date list so you guys don't have go to searching our archives from when we first posted them. Train, easily remembered for their hit "Drops of Jupiter", is back on the scene and preparing for the release of their fifth studio album. The album, "Save me San Francisco" is set to release on October 27th. However, Billboard.com is exclusively streaming the band's new single "Hey Soul Sister", a catchy upbeat song with a great folk-rock feel. After a three-year hiatus this is just the song that Train fans have been waiting for, and offers a glimpse of what we can expect from their upcoming album! Head over to Billboard to check out "Hey Soul Sister" now! Want to Be in a Music Video? The Script is about to shoot the video (US version) for their new single “Breakeven”, but first they need your help! Submit a video of yourself to The Script's YouTube group singing and/or lip-synching along to the song, and your clip could be featured in the music video! Be creative and do whatever you can to express the emotions “Breakeven” brings out in you — react to the song, make it your own and most importantly, have fun! If you’re not familiar with the new single, listen to and get lyrics for “Breakeven”. You must be 13 years of age or older to participate, and preference will be given to videos with only one person in them. Good luck! Click HERE to submit your video! Hey People!! Here is the track list for Boys Like Girls new album "Love Drunk", which hits stores September 8th! A little lower is a clip from the making of the new album. You can pre-order NOW or on iTunes on Tuesday! Here it is. I told you guys the video was coming soon. Nice summertime anthem and summertime fun in this video right here. Enjoy. Till the Casket Drops coming October 20. Recently, U.K. electro-pop artist, Imogen Heap, sat down with Billboard to discuss her upcoming album Ellipse, her fascination and fan connection via Twitter, and her single "First Train Home." Check out the two part interview below.